Texas Attorney General Ken Paxton is wading into another fight over local control; this one about plastic bags at grocery stores. The lawsuit, filed in Cameron County, is Paxton’s first attempt to thwart city efforts to curb waste by charging for bags or banning them. He joins the Texas Public Policy Foundation, the powerful conservative group, in that broad effort. The Brownsville bag fee was passed in 2011, but Paxton is only getting involved now that an appeals court has overturned Laredo’s bag law. You would think that since cities are responsible for garbage collection that cities ought to have a fair amount of leeway to take measures to minimize and optimize that task, but then you would not be Ken Paxton or his meddling enablers at the TPPF. 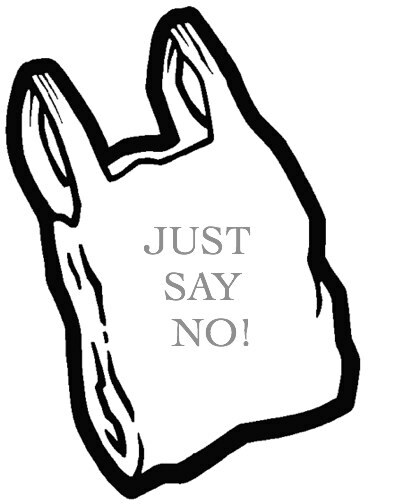 Why is a fee for plastic bags different than a fee for (say) heavy trash pickup or disposal of toxic chemicals? I’m pretty sure the answer to that question will be “it just is” and “because we said so”. If we want different outcomes, we need different leaders. It was a bad year last year. Recycling continues to hurt Waste Management’s bottom line, as low oil prices and low commodity prices have made that a challenging business for at least the past year. The Houston company on Thursday reported a decline in revenue and earnings for its fourth quarter and full year in 2015, as it sheds some unprofitable recycling contracts and works to expand higher-margin business. Net income in the fourth quarter was $273 million, down from $590 million in 2014, and earnings per share dropped to 61 cents, from $1.29 a year earlier. “The business is firing on all cylinders, save two areas: recycling and environmental services,” CEO David Steiner said during a call with investors. Waste Management has been coping with tough times for residential recycling that spread across the industry. In many cases the company is no longer able to cover the costs of collecting and processing paper, cans and plastic bottles with the revenue it gets from selling them. In paper, “if they can improve their processing costs per ton, you survive,” Hoffman said. But slower economic growth in China has contributed to lower prices for recycled metals, while the low price of oil makes virgin plastic cheaper to produce than using recycled plastic. “It’s just very hard to cover your cost of processing,” Hoffman said. Glass causes problems for waste companies by damaging sorting machines while it’s sold at very low prices, and consumer confusion over what to put in recycling bins makes recycling more expensive. Companies spend money removing non-recyclables from the stream, and contamination reduces the quality, and therefore price, of the recyclables they sell from collection. Waste Management cut its recycling expenses by 15 percent from a year ago, Steiner said, and is working to renegotiate municipal contracts so that it doesn’t shoulder all of the costs of recycling when it’s operating at a loss. Already it has renegotiated 75 to 80 percent of its contracts, Steiner said. See here, here, and here for the background. Waste Management of course also has a contract with Houston, one that has been pretty good to the city, allowing it to buy the equipment needed to bring curbside recycling everywhere at a faster-than-expected pace. City Council is scheduled to vote on whether to continue the single-stream recycling program today. I don’t know if the terms are the same as before or not, but I’m sure that will come up. City Council this week will consider a four-year deal with Waste Management that will increase the fees the city pays the company to process its recyclables and will, for the first time, put Houston on the hook if the firm cannot cover its costs by reselling the recycled items. If Houstonians keep rolling 5,400 tons of recycled material to the curb each month and current commodities prices hold, city officials project the cost to the city will be more than $3 million a year. As if they didn’t have enough to deal with. As low commodity prices have left recyclers short on cash to invest in technological upgrades, product manufacturers are coming out with new types of packaging that make business even tougher. These products include lighter-weight plastic bottles, resealable pouch containers and other items that are popular with consumers and often better for the environment because they require less energy to produce and transport. Water bottles are made with less plastic now, for example, and thin plastic film is replacing heavier packaging. But poor consumer education means that items like trash, grocery and dry cleaning bags end up in recyclers’ sorting facilities where they don’t belong and can jam machines. Clear plastic pouches also have become popular. In addition to their convenient zip-close tops, they use less material. But in sorting facilities, machines often mistake the flattened pouches for paper and end up placing them in the wrong place. Thinner plastic bottles are now more easily flattened, too. For recyclers, the challenge remains in keeping consumers educated about film and other materials that don’t belong in recycling bins. See here for the background. I don’t have anything to add here, just to note that it’s another item on the “educate the public about how to recycle” to do list. Whole lot of not so good in there. When Waste Management bought the plant in 2010 and converted it to handle single-bin recycling, commodity prices were high, the city was on board and Houstonians were eager to recycle. As the company introduced single-bin recycling, residents became ever more vigilant about keeping bottles, cans and newspapers out of local landfills. But they also started throwing in nonrecyclables, which gum up machines and drive up costs. It’s a national problem that Waste Management, based in Houston and one of the largest trash and recycling companies in the country, and its competitors have been grappling with the past few years. Recently it’s gotten worse. Back when commodity prices were peaking in 2011, companies could absorb higher costs of weeding out trash. But prices have dived since, and Waste Management is finding it can cost more to sort and process material than what it can get for selling it. The sorting process costs $75 to $150 per ton, depending on how contaminated a load is, vice president of recycling operations Brent Bell said. The company then sells recycled material for just $80 per ton on average. “Unless we can work out a way where recycling is profitable over the long term, there’s not going to be recycling,” CEO David Steiner told investors during a downbeat conference call last week, noting that commodity prices have sunk to new lows. “It’s as low as it’s ever been, but we haven’t seen any indication of a bottom,” he said. Now that profits have plummeted, companies have more incentive to communicate what is recyclable. “You have this whole perfect storm of things that has put the MRFs (materials recovery facilities) in a very difficult position,” said Patty Moore, CEO of consulting firm Moore Recycling. Most facilities are set up to handle more paper than other materials, Moore said, but as reading physical newspapers declined, along with other uses of paper products, many of those facilities now operate less efficiently. Then there is the decline in commodity prices. Not only has China, a major destination for recycled materials, tightened its standards on the materials it accepts based on contamination, known as China’s Green Fence, but the nation is paying less for recyclables. Growth there and in other developing countries has been lower than projected back in 2011, weakening demand. They’re also producing more of their own recycled materials. “If you look at the whole economics of that industry, it’s not very favorable,” Bell said. Cheap oil is also a culprit, as newly made plastic is no longer more expensive than recycled plastic. For better or worse, it’s a lot easier to be green when oil is up over $100 a barrel. Something as simple as putting recycling in a garbage bag throws off the process because the bag can’t be recycled. Depending on the volume workers are dealing with on the conveyer belt, they may rip it open, or just throw out the whole bag and its contents. In March, Houston’s contamination rate was 17.4 percent. “A fifth or a sixth of the material that’s going in there is really of no value, and not only is it of no value in terms of the end product, it tremendously increases the processing cost,” said Puneet Bhasin, who now runs Waste Management’s recycling business. Contamination is why most in the industry see one-bin policies, like that Houston is pursuing, as a step in the wrong direction. Once paper gets wet or gets food on it, it has pretty much lost all value for recyclers. That was the first thing I thought about as I read this. Whatever you may think about the One Bin proposal, and whatever the state of the technology may be, the current level of recycled commodity prices may mean One Bin is economically unfeasible, at least for now. That’s why I keep harping on where the Mayoral candidates stand on stuff like this. As the story notes, Houston signed a sweetheart deal for the collection of its recyclables when commodity prices were good. 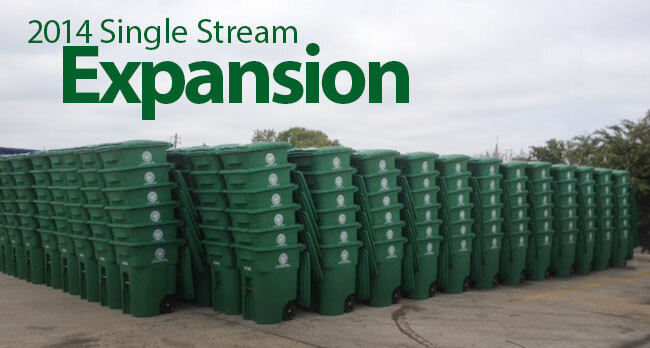 The expansion of the single stream program was largely financed by the revenues this deal generated. What happens when that deal expires? How committed are the candidates to recycling if we can’t get paid, or only get paid a minimal amount, for it? This is a non-trivial amount of money we’re talking about. It sure would be nice to hear the Mayoral hopefuls talk about this. As far as the existential question goes, times may be bad for recyclers, but they will get better. There’s no going back – we don’t have the landfill space, and even if we did too many people wouldn’t accept it. But maybe we need to start thinking about recycling more as a utility, like trash collection, and treat it more like that. If that means adopting trash fees to support it, then so be it. Again, though, that’s a question for the Mayoral candidates. See what I mean? Finally, as far as the contamination issue goes, the story spends a fair amount of time on that and mentions an outreach program that Waste Management is doing to educate people about what should and should not be put into recycling bins. It was the first I’ve heard of it, but I’m glad someone is doing this. The folks who oppose One Bin advocate for more of this kind of public outreach to help boost Houston’s recycling rate to at least the national average. Putting aside the challenge that low prices for recycled materials creates for that, what does that kind of program look like? What is the time frame for it? Is there a city whose example we could follow? And again, what are the next Mayor’s priorities for this? The One Bin path and the Not One Bin path are very different, and each his its own risks and rewards. I’m not going to stop harping on this until the candidates give me a reason to stop. The city five proposals for One Bin last July, and at the time we were told that there would be a recommendation by the end of the year. That clearly ain’t gonna happen. I’ve done my best to keep an open mind about this, partly because it seems like a cool idea and partly because when people one respects disagree vehemently about something one doesn’t feel one is an expert on, it can be hard to decide who’s right. At this point, it’s getting hard to see how this happens unless one of those proposals really knocks our socks off (which if it had, we surely would have known by now) or the next Mayor is as gung ho for it as Mayor Parker has been. Of course, as of this writing I have no idea what any of the Mayoral candidates think about this, which seems a shame given that it’s potentially either a revolutionary new technology or a multi-million dollar boondoggle. While I sympathize with the drudgery of contacting so many campaigns to ask their position on every issue like this, I’m going to start to get cross with Chronicle reporters if they don’t do it. This is a big deal, and we need to know what they think about something other than potholes and pensions. I don’t expect a detailed white paper at this point of the campaign, but if a candidate hasn’t thought about this sort of thing enough by now to generate a coherent sound bite for a newsie, that tells me something about his qualifications for the office. Campos has more. Yesterday was a big day for the One Bin for All proposal. Thursday [was] the deadline for private companies to submit bids to the city to build and run the facility. The bid guidelines call for a 75 percent diversion rate — that is, only 25 percent of solid waste should end up in landfills. The rest would be recycled, composted or converted into energy sources. Currently, the city recycles 6 percent of its waste and diverts 19 percent overall, mostly lawn waste. Those numbers are well below state and national averages. [Sustainability Director Laura] Spanjian pointed to a brand-new facility in Montgomery, Alabama, as proof that a one-bin system can work. Kyle Mowitz, the CEO of Infinitus Energy, which runs the Montgomery facility, said it has achieved 60 percent diversion since opening in April. “I would’ve never done this project three years ago,” he said.“The technology wasn’t there.” Recent advances in optical technology and air density classification, Mowitz said, have “gone through the roof,” making mixed waste processing more practical. Mowitz, who said he expects to start turning a profit over the next year, added that the diversion rate should go up once the facility adds an anaerobic digestion system, in which microorganisms break down organic waste that might otherwise end up in landfills. The Houston plan also calls for anaerobic digestion. Critics argue that the technique may not work for unsorted municipal solid waste streams, which lack the uniformity that the microorganisms prefer. Paper and steel industry groups have opposed One Bin for All. 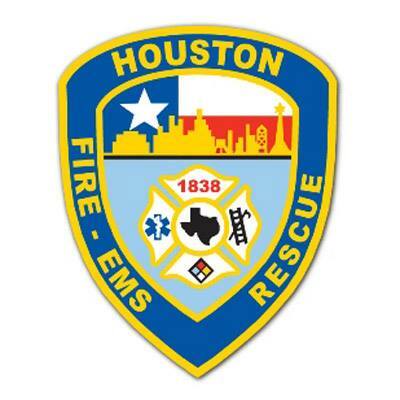 In a letter to Houston Mayor Annise Parker, who supprts the plan, Gregory L. Crawford, executive director of the Steel Recycling Institute, which represents steel manufacturers, warned that the program “would produce unacceptable levels of contamination” in steel cans. The RFPs were issued in April. I sent a query to the Mayor’s office yesterday afternoon asking how many proposals were submitted, from whom, and if information about them were posted somewhere. I have not yet received a response, but when I do I will write about it. As we know, the One Bin proposal is controversial, with several environmental organizations, banding together under the Zero Waste Houston banner, leading the opposition. Here’s their latest response to One Bin For All. The new report examines dozens of “one bin”-style waste facilities (known as “dirty material recovery facilities,” or dirty MRFs) that have failed in other cities or are only used as a last resort for the garbage stream. Their research contradicts claims made by proponents at the City who say the technology is now capable of recycling the vast majority of residential trash. The report also cites massive air pollution problems with trash gasification or pyrolysis, which are incineration technologies the City of Houston is also considering under its proposal. Not a single trash gasification incinerator has operated successfully in the U.S., but overseas they have caused health-threatening pollution violations such as dioxin emissions. Opponents point out that such an incinerator would likely be built at an existing waste facility, all of which are in working-income communities that are already saddled with disproportionate pollution problems. And it wouldn’t be the first time: The report also shows that Houston has a well-documented history of siting incinerators and landfills in communities of color. In 1979, The City contracted with an experimental “mini-incinerator” technology that the industry promised would be “pollution-free.” Those mini-incinerators were shut down when such claims proved to be false. The Zero Waste report is here. It’s long and detailed, and largely boils down to the arguments that “mixed materials recovery facilities” are more about incineration than recycling, while separating organics from recyclables is much more effective at actually reducing waste. Melanie Scruggs of the Texas Campaign for the Environment wrote a guest post here recently discussing how Houston could improve its recycling rate with the big green bins that are now being used. Zero Waste also produced two letters, from coalitions of paper recyclers and steel recyclers that advocate for keeping organics away from these items. Finally, there’s a report by Dr. Bullard about the likely effect on minority neighborhoods, since they tend to be where waste facilities get located. The city’s argument is that modern technology renders most of the objections moot. Zero Waste marshals a lot of evidence against that, and I’ll leave it to you to read their report and judge for yourself. Perhaps we’ll get a better feel for the city’s rebuttal when we see the proposals that they received. UPDATE: Got a press release this afternoon saying the city got five proposals, and “will have a recommendation by the end of the year”. I will have more on this next week. Houston has significantly improved its recycling rate by expanding single-stream recycling, or the “big, green bins.” While the smaller, 18-gallon green boxes only had a participation rate of 22%, the larger recycling bins are up to 62% recycling participation since the larger bins are a better, more convenient design and they accept more materials. Following successful models of cities like Denver, Los Angeles, Toronto, Dallas and Austin, Houston can improve its recycling rate beyond our current 6% or next year’s expected 12% by implementing education programs and incentives. First and foremost, all homes serviced by the City’s waste services need to have the same, consistent recycling program. Right now, some neighborhoods have dual stream while others have single-stream; some neighborhoods recycle glass separately and others do not. Inconsistent recycling services unnecessarily complicates City-wide public education and messaging, makes it more difficult to teach communities how to recycle and can cause people to give up on recycling properly. Consistent, single-stream recycling where all recyclables go in one container separate from trash really does simplify the process. Next, we need consistent promotion and education to explain what items go in the recycling bins. Recycling messages may take a plethora of forms: bus signs, billboards, bill inserts, social media, speaking in neighborhood meetings and even in schools. Speaking to elementary school students is one of the most effective recycling education methods, since kids are great at teaching their parents how to recycle. This is especially true in multi-lingual homes or in homes where parents have not recycled previously. Teaching youngsters responsible, environmentally conscious behaviors such as recycling will hopefully also encourage them to be sensitive to the environment throughout their lives and future careers. Broadly speaking, recycling media and messaging should be tailored to reach populations with different interests and values. Environmentalists are going to be compelled when you say it is good for the environment, but that’s not everybody—maybe not even most people in Houston. The City may explain how recycling creates jobs, saves tax dollars in the long run and teaches resource conservation to connect with one group; explaining how recycling means less dumping on environmental justice communities connects to another. We live in an era where mass communication can be tailored to very specific audiences. Goodness knows I saw Mayor Annise Parker’s campaign ads all over my internet; surely the City can promote recycling that effectively. At the individual or neighborhood level, stickers on recycling bins and door-to-door communication have been proven highly effective in cities like San Francisco, where they divert 80% of waste from landfills. Some cities have also appointed neighborhood “block leaders” where neighbors encourage each other to recycle properly and help distribute recycling instructions and media. Council member Bradford once suggested that the City create some kind of recycling competition between neighborhoods and invent rewards for neighborhoods that recycle the most. Door-to-door visits may also target areas with low recycling participation or high contamination. City employees may use stickers and notes on recycling bins to inform people what they are doing right or what needs improvement. Door-to-door visitors are very effective since they can take some time to explain what items are recyclable in the City’s recycling program, what isn’t, why it is important and make sure residents understand the incentives in place. All waste services have a cost, but not all communities have waste fees or a designated monthly charge to fund trash, compost and recycling services. Some cities pay for waste disposal from general funds and are able to achieve high recycling rates through consistence services and promotion. Toronto, for example, has no waste fee and boasts 49% diversion from landfills—about 3 times that of Houston. Part of Toronto’s success is likely due to their curbside food waste collection and a commitment to strong education programs. Monthly charge-based incentives do create powerful economic incentives to increase recycling, however, and have proven successful in other cities. Unit-based or “SMaRT (Save Money and Reduce Trash)” pricing allows customers to pay less if they recycle more. While some communities may determine the amount through metering, where each load of trash set out at the curb is weighed, this is unnecessary and often unpopular. An easier solution is to offer different sized trash cans—24 gallon, 36 gallon, 64 gallon and 96 gallon—and to charge customers more for bigger cans, incentivizing waste reduction as well as recycling. In general unit-based pricing can reduce waste disposal by up to 50% and increase recycling by up to 40%. EPA estimates that PAYT policies in 2006—which covered only 25% of the US population—diverted about 6.5 million tons of waste which would have otherwise been thrown away. They estimated then that the policies reduced disposal by an average of 17%. Mandatory curbside recycling and composting programs are controversial, but they are also very effective at incentivizing participation. Essentially these are ordinances which say that the City will not collect any waste if either recycling or composting are not also present, or if there is recycling or composting present in the waste. Customers are still free to self-haul their discards to a landfill and pay gate fees there, but City collection crews will not throw valuable commodities into the landfill themselves. Such policies are best implemented after all other incentives, education and programs have gone into effect to capture the last chunks of material after recycling, composting and other programs have become widely accepted. Promoting recycling not just at home for homeowners, but also at apartments, condos, businesses, events and public spaces contributes to an overall recycling culture. If people don’t have recycling available until they move into a house, they are less accustomed to recycling and participation tends to be low. Consistent recycling programs at businesses, public spaces, tax-exempt institutions and schools also maximize potential job creation, revenue and conservation for the City. Plenty of businesses take on voluntary recycling services or are interested in reducing waste in order to increase efficiencies and lower costs. Boeing and Mitsubishi for example have committed to Zero Waste to landfills and this is a growing trend in the business community. Voluntary efforts are important to lead the recycling culture, and recycling ordinances are also key to long term improvements in recycling outside of the City’s residential service area. Note that some homeowner associations that have opted out of City waste services and in exchange for a refund or sponsorship program for private waste contracts. Houston could pass an ordinance requiring recycling in these opt-out neighborhoods or make it a condition of the grant that these neighborhoods have to provide single-stream recycling similar to what the City provides its customers. Other aspects of a recycling culture include recruiting recycling-reliant industries, re-use centers, swap shops and salvage from bulky trash collection. Austin just started a promotional program to support local businesses that sell recycled products. Recycling is good for the environment and creates tens of thousands of jobs in our region; we should support manufacturers that use recycled content or re-use materials. Publicly committing to supporting the recycling industry will increase overall buy-in to recycling programs at home, work and play. In addition to recycling and compost, cities with a recycling culture are advocating for better product design. There is a nationally coordinated effort around container packaging, for instance, to eliminate non-recyclable packaging designs for certain products. Since our tax dollars pay for recycling and waste programs that dispose of millions of dollars’ worth of packaging every year, it makes sense that we should advocate for design that would lower the cost of recycling and disposal. This policy framework is called “extended producer responsibility” and aims to create economic incentives for producers to improve product design to achieve longer lifespans with greater durability and safety. Note that this definition specifically excludes phased incineration technologies such as gasification, which has been proposed for the City of Houston’s “One bin for All” proposal. In practice, local and commercial Zero Waste standards vary with 90% diversion or higher being a common goal. Both Dallas and Austin have Zero Waste goals, and San Antonio has a short-term goal to divert 60% of its waste by 2020. Recycling, composting, and waste reduction are all higher and better uses for these materials than incineration according to the EPA. Unlike unproven technologies like gasification of solid waste, Zero Waste relies on proven technologies such as separate recycling and organics collection. We hope that as soon as the City abandons its inkling toward gasifying our trash, we will see real leadership in establishing education programs and incentives to increase participation in the “big, green bins” recycling program, which is already showing success and fostering a culture of responsibility, unlike “One bin for all,” which fosters a culture of waste. Houston’s low recycling rate is a sign of opportunities we have yet to explore and provide to all residents. We believe the right services and education programs will yield successful results just like they have in other Cities, and set a positive example for other communities to follow. Melanie Scruggs is the Houston Program Director for Texas Campaign for the Environment, a statewide, grassroots advocacy organization for waste and recycling issues. Melanie graduated from the Plan II Honors program at the University of Texas at Austin in 2012. Mayor Annise Parker today announced the issuance of a Request for Proposals and creation of an advisory committee for the One Bin for All waste management and diversion project. 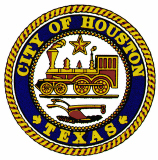 The City of Houston invites submittals from short-listed firms that participated in an earlier Request for Qualifications process. The City is seeking a public-private partnership that will significantly increase its overall waste diversion rate, create jobs, reduce expenses to the City, reduce emissions compared to current processes, and protect and educate local communities. Submissions are due July 12, 2014. A pre-proposal conference will be held on April 29, 2014. Jeff Taylor – Vice President, Freese and Nichols, Inc.
Last year, Houston’s One Bin for All idea was one of the five winners in Bloomberg Philanthropies’ Mayors Challenge, a competition to inspire American cities to generate innovative ideas that solve major challenges and improve city life – and that ultimately can be shared with other cities to improve the well-being of the nation. Bloomberg Philanthropies’ mission is to ensure better, longer lives for the greatest number of people. Houston was selected as a Mayors Challenge winner out of a pool of over 300 applicant cities, based on four criteria: vision, ability to implement, potential for impact, and potential for replication. One Bin for All was also the first place winner of the Mayors Challenge Fan Favorite Selection. 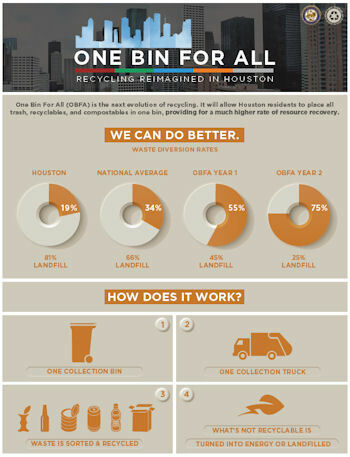 For more information please visit www.houstontx.gov/onebinforall. Groups and individuals who oppose the One Bin for All proposal include the National Sierra Club CEO Michael Brune, Annie Leonard, Founder of the Story of Stuff Project, the local Sierra Club Houston Regional Group, Texas Environmental Justice Advocacy Services (T.E.J.A.S), the San Jacinto River Coalition, Houston Peace and Justice Center, Public Citizen TX, Texas Campaign for the Environment and thousands of Houstonians who have written letters or emailed City Council since last March. We all believe that commingling trash and recycling will lower real recycling rates and that bringing incineration technologies like gasification or pyrolysis to Houston or any other city will threaten public health, compete with recycling and waste reduction, and put the City of Houston and its taxpayers at financial risk. While the City claims the public-private partnership will reduce costs to the City, the proposal clearly calls for tax incentives including 380 Agreements and tax-exempt financing that will lock the City into a decades-long public subsidy for technologies that have a horrendous track record of cost failures, emission violations and failures to produce energy. While the One Bin plant may produce a little over 100 jobs, expanding recycling to the entire City could produce thousands and thousands more if curbside composting is implemented. Real recycling and composting will do more to reduce greenhouse gases than incineration ever could, because incineration of recyclable materials means that raw materials will have to be extracted again. And yes, gasification and pyrolysis are incineration technologies according to the EPA, despite what the City’s public relations people want to think. The announcement of the “Advisory Committee” has been made for PR purposes and raises more questions than hopes. What exactly is the Advisory Committee supposed to produce? Why were they not invited to participate during the RFQ process wherein the City heard from respondents about the technologies under consideration? None of the local groups who have voiced concerns about a One-Bin program been asked to serve on the Advisory Committee, and no one from the neighborhoods where this facility will be built has been invited either. It is also ineffective to evaluate “One Bin for All” in isolation while groups have proposed alternatives, including keeping recycling and trash separate, implementing organics recycling, creating new incentives and investing in education programs to boost participation. The participation rates with recycling have been increasing since the City has started to switch to the “big, green bins” and we believe the “One Bin for All” will waste the progress Houston is currently making in real recycling. Without any investment in public education whatsoever, the participation rates have still increased from 22% to 62% with the big, green recycling bins simply because they are a better design. Far from “innovation,” what City Hall is proposing is a proven failure that will set real progress on waste reduction, recycling and sustainability back for years to come. Houston needs a long-term plan to eliminate waste at its source and provide universal recycling where we live, work and play, the way other cities in Texas and across the country are now doing. City Hall needs to abandon this terrible proposal that would turn our trash in to air pollution, harming the environment, our health and the recycling economy. So there you have it. I will be very interested to see what kind of responses the RFP gets. What are your thoughts on this? UPDATE: Here’s the Chron story on this. Mostly familiar information if you’ve been following this story, but a good overview if it’s new to you. Laura Spanjian, Houston’s director of sustainability, says the city is spending millions to expand its conventional recycling service and is still evaluating all the options for its one-bin concept. The city hopes that the one-bin idea would eventually divert three-quarters of its trash from landfills and that new facilities would create more than 100 “high tech” jobs. Spanjian said the city believes its proposal is the best way to boost dismal recycling rates and save money. Kim Jones, a a professor of environmental engineering at Texas A&M University-Kingsville, said that recyclable material is most valuable when it is dry, so mixing it with trash such as food could make it harder to sell. “That’s going to contaminate your paper, and your end user is not going to want that material,” he said. The Texas Campaign for the Environment, an advocacy group, said that China, a major market for America’s recyclables, has recently begun rejecting contaminated paper. And the group’s program director, Melanie Scruggs, is skeptical about the city’s promise of jobs. Sorting facilities “depend on workers to sort out the waste from the recycling, so whatever objects you’re telling people to throw in there with recyclables potentially creates dangerous working conditions,” Scruggs said. “Nobody wants to create jobs where you’re sorting through trash.” While Houston points to Roseville, Calif.’s one-bin system as a model, Scruggs said her group has visited the town’s facility and found workers who had to sort animal waste from other trash, a potential health risk. Spanjian said the sorting and drying technologies for waste have improved. She added that the city would turn whatever is not recyclable into energy through some form of gasification. That would involve heating the waste in a chamber to create synthetic gas, which could then generate electricity or be turned into fuel. But questions also remain about the waste-to-energy strategy. A study released last year by SAIC, an engineering and consulting firm, found that the cost of turning waste into usable energy could run higher than $100 per ton. 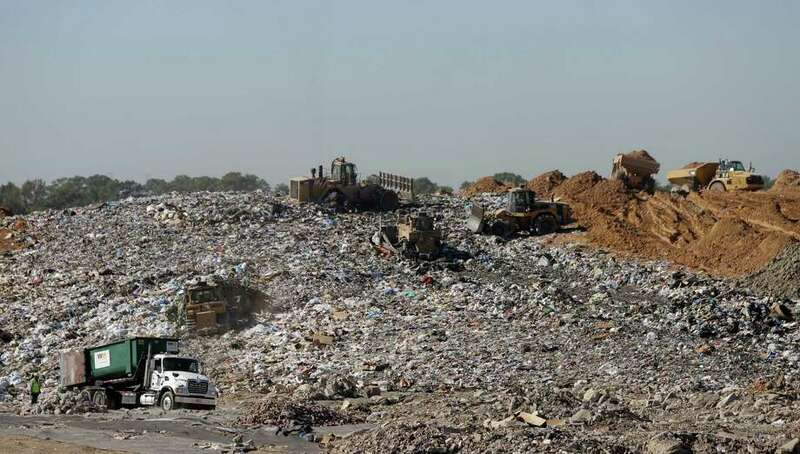 Houston now spends just $24.60 per ton on landfill fees. “There’s a huge interest in the topic,” said Scott Pasternak, an environmental consultant who worked on the study. “It can technically be done, but the cost of doing that is going to be, at this point in Texas, substantially greater than existing technologies.” Pasternak said landfill costs are much higher in California, which is why waste-to-energy strategies may be more feasible there. Here’s the One Bin website. The main thing I learned from this story that I didn’t already know is that Austin’s recycling rate – 24% – is nothing to write home about. The city’s strongest argument is that it can get a much higher diversion rate via One Bin than it could via single stream recycling. That’s hotly disputed by opponents like the Texas Campaign for the Environment, who argue (among other things) that a broad-based education and outreach campaign combined with finishing the job of bringing single stream recycling to all eligible Houston households would boost diversion rates considerably. I get what they’re saying, but I think that would need to be an intensive and long-term project. As it is, even in neighborhoods like mine, lots of people don’t use the big green bins, and in my experience every public space that has separate garbage and recycling receptacles there’s more garbage in the recycling bins and more recyclables in the garbage bins. It’s going to take a long time and a lot of work to change habits, is what I’m saying. Taking an approach that doesn’t depend on people doing the right thing has some appeal to it. 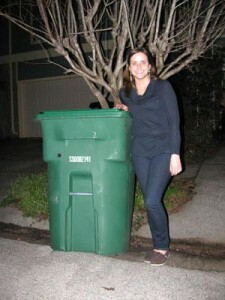 Be that as it may, TCE has launched a new website, Zero Waste Houston, to push back on One Bin. Their strongest argument to me is the fact that none of this is proven technology yet, and claims about turning non-reusable waste into energy are suspect at best. I had the opportunity to hear Don Pagel, the director of the One Bin program, and Melanie Scruggs of TCE talk to our civic association recently. They both do a good job advocating for their respective positions, and as much as they disagree on this strategy they both agree on the ultimate goal of diverting less waste to landfills. The main fact I learned from that meeting was that the city will be putting out RFPs in the next month or so. RFQs were put out last year, and this is the next step. If anything is going to happen with this – and there’s no guarantee of that – we’ll know it in the next twelve months or so. The city of Austin takes another step on its path towards zero waste. Austin restaurants and other food businesses will have to compost food scraps starting in 2016, under new rules the City Council OK’d Thursday. Food service businesses — including fast-food chains, caterers, cafeterias and bars — that are bigger than 5,000 square feet will be required to separate out organic and compostable materials from other trash and have them picked up by private haulers. Smaller food businesses will have to comply starting in 2017. Food trailers will be exempt for now, because the city needs to spend more time developing rules unique to them, said Bob Gedert, director of Austin Resource Recovery, the city of Austin’s trash and recycling department. Under the rules passed Thursday, large food service businesses also will have to recycle several materials, including paper, plastics and aluminum, starting next year. Smaller food businesses will have to comply later. The new rules aim to help the city meet its so-called zero waste goal of dramatically reducing the trash sent to landfills by 2040, Gedert said. Food scraps and other compostable goods make up 40 to 50 percent of the trash that restaurants generate, Gedert said. Keeping those goods out of the landfill will go a long way toward achieving zero waste, Gedert said. The policy passed Thursday builds on rules that the city enacted last fall, when it began requiring large apartment properties and office buildings to recycle more materials. Don “Skeeter” Miller, co-owner of County Line restaurants and president of the Greater Austin Restaurant Association, said the membership was initially skeptical of the compost rules but is now mostly supportive, mainly because the rules won’t take effect for a few years. Austin already has a pilot program for curbside composting for residences. Restaurants are obviously a big source of food waste, so bringing them into the picture ought to make a significant difference. Here in Houston, the One Bin For All plan will deal with compostable refuse, but that is just for residences. Going back through my archives, it’s not clear to me if “residences” means just the places currently covered by city of Houston trash pickup or if it also includes apartments, but in either case it does not include businesses, particularly restaurants. I would like to see Houston extend its vision to include businesses and office buildings as well. One thing at a time, I understand, I’m just noting this for the record. I wish Austin all the best in this effort.